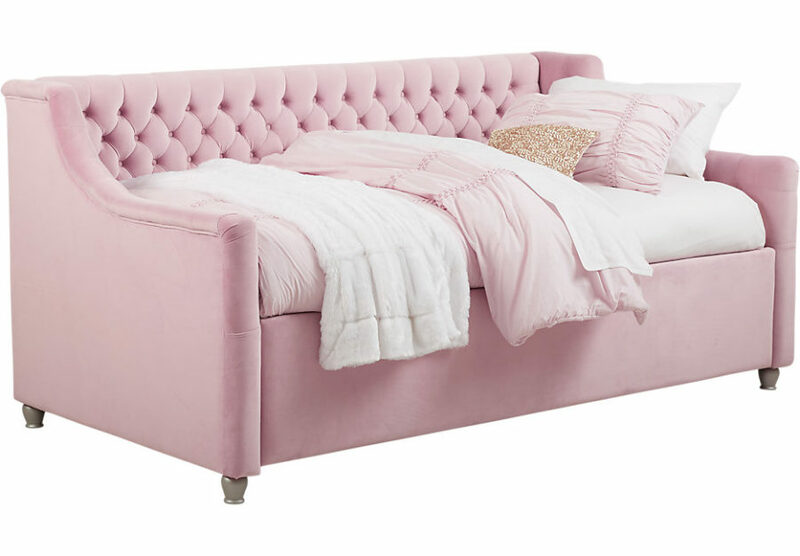 Rooms to Go Kids has this gorgeous blush pink daybed on their roster and we immediately fell in love. It’s a great piece for a guest room or your little one’s new big girl bedroom. We love the idea of accenting it with creams, whites, and gold for extra bouts of fairy-tale quality. Here’s something you don’t see everyday. 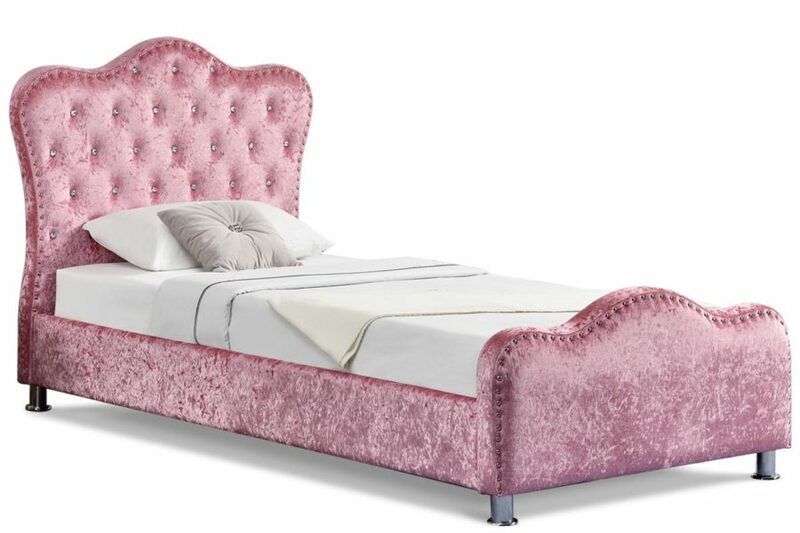 This crushed velvet bed from Sleep Design will transform any bedroom of the house into something more magical and more royal. It’s really a bed fit for a princess. 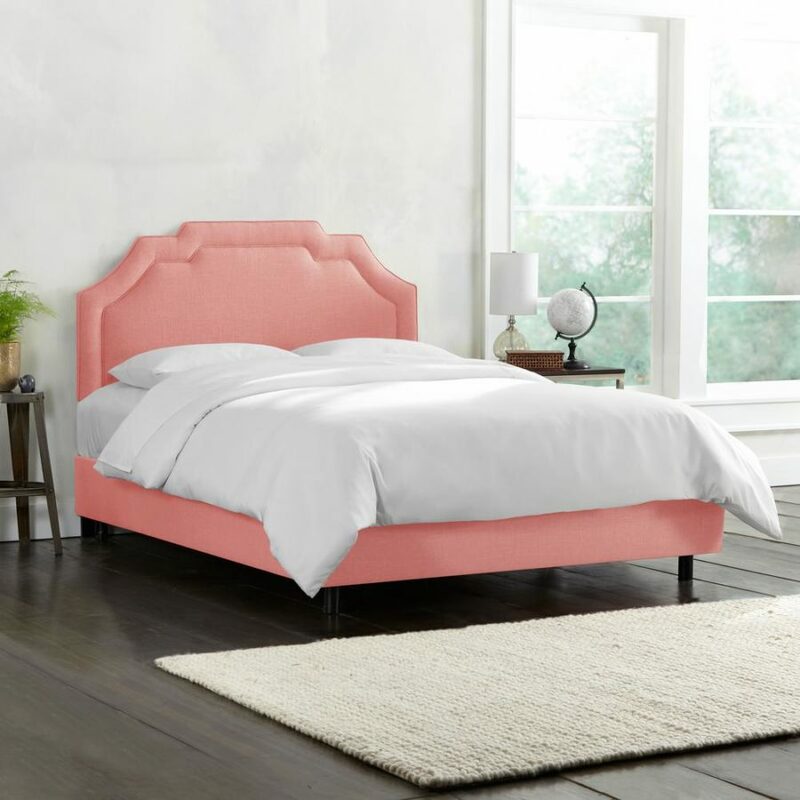 Decorpad had this beauty up their sleeve and we fell in love with both its traditional style and peachy hue. 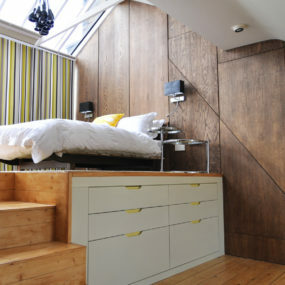 It can be used for all kinds of bedrooms – for all kinds of people – and still add a contemporary flair. Pair with creams, golds, and other metallic tones to match the hardware. Target had several to choose from as well. 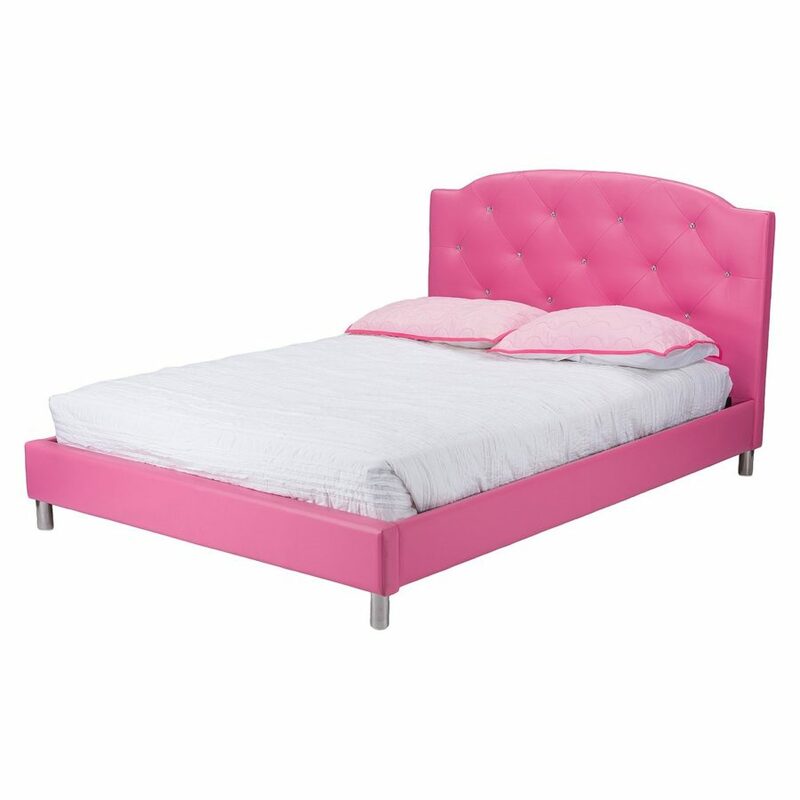 This hot pink design caught our eyes because of its glam presence and tufted features. Little ones would love to have this a part of this “big girl, princess” room, don’t you think? A more traditional style but with a coat of paint that can rock the entire house, check out this find from PB Teen. 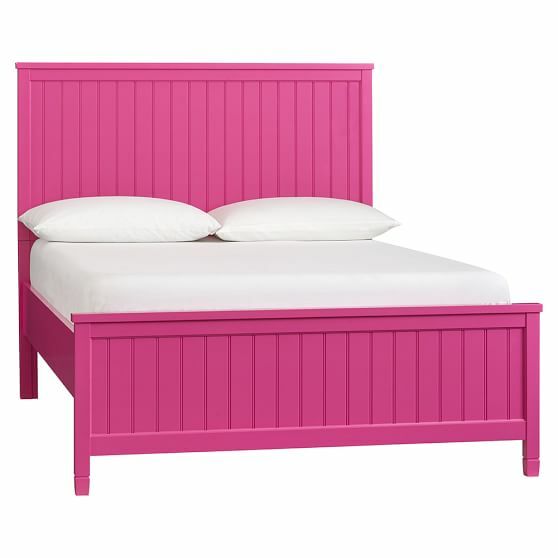 A beautiful shade of pink enhances the simple nature of this bed. Use it for teen bedrooms or even the guest room for something bold. 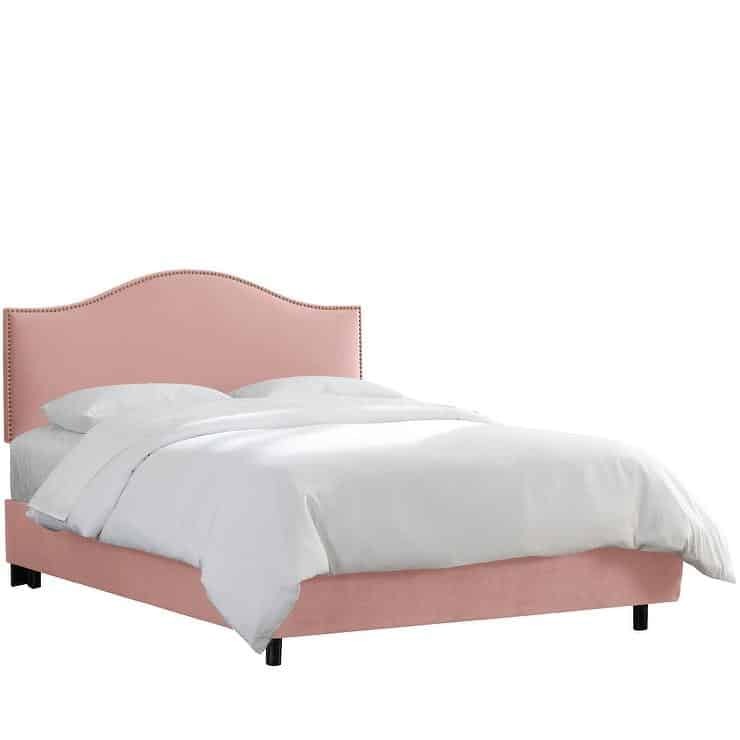 West Elm always has beautiful pieces and this blush design is no exception. Contemporary and perfect for a minimalistic lover, this tone will blend well with a variety of neutrals. It’s just enough to bring a bout of personalization to the mix. Here’s another blush choice that has a romantic spirit and contemporary vibe. 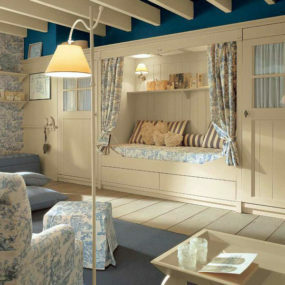 It’s more versatile as well, being able to mix with vintage or modern styles. You can find this – and others – by visiting Wayfair and checking out the details further. Over at Amazon, you’ll find a design that’s perfect for our most youthful of bedrooms. The studded finished add a grown-up, modern flavor and the teal pairing pops right off the pink tone. If you’re looking for a way to spruce up a room, go with an option that’s both offbeat and usable. Coral is a pink shade that’s not only on trend but it’s full of sass and sensuality. It’s a great choice for a bachelorette bedroom. 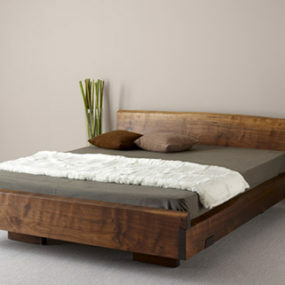 And, we just so happen to find the most perfect of beds in that same tone over at Overstock. If you’ve got a vision in mind concerning your headboard, check out this design from The Home Depot. 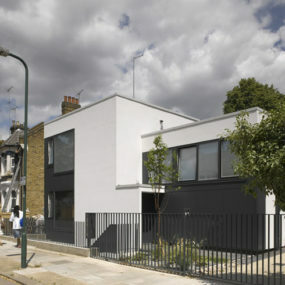 It’s again, contemporary in style, but it has a more unique shape that you can easily personalize. Beautiful with black but also nice paired with creams and whites too. 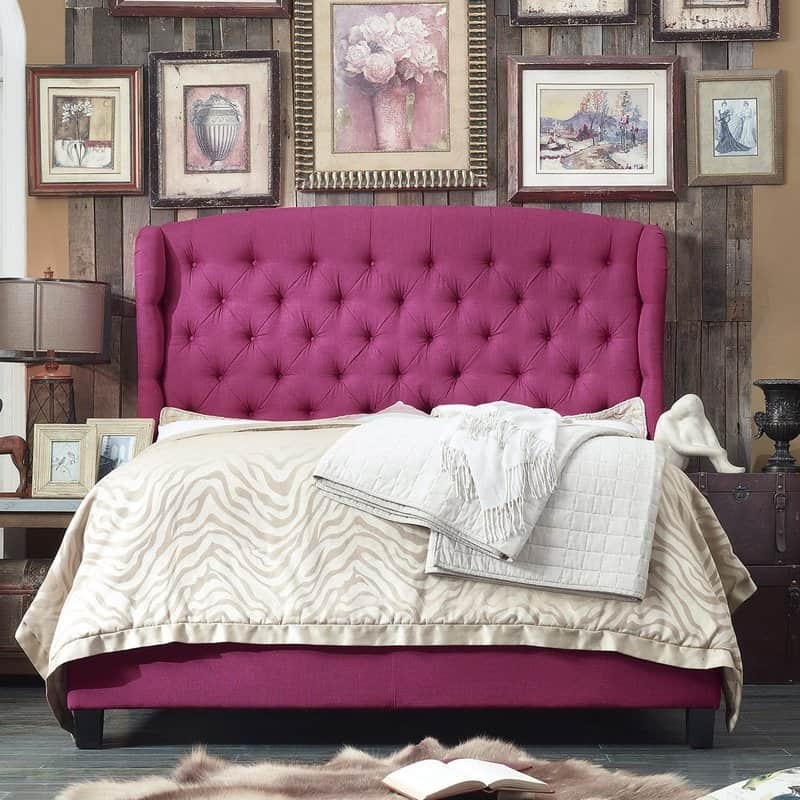 Birch Lane has fuchsia options up for grabs and this particular design is a stunner. Tufted and lush, choose those for rooms that you want to appear a bit grander. Prints, golds, and other neutrals will be the perfect accompaniment to its overall look. 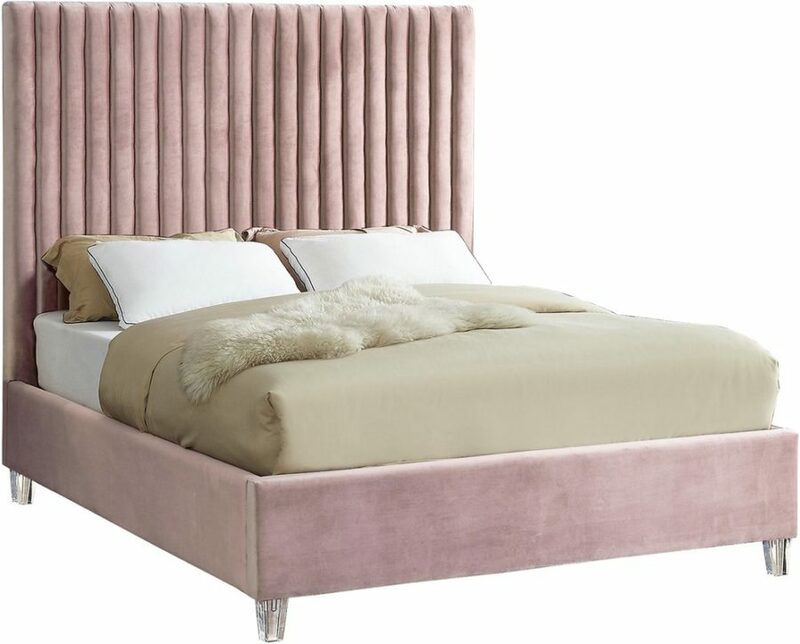 Joss and Main has a pink bed with a tufted headboard as well. It holds the added studs in its design which pushes that more modern and elegant look. Again, this one is perfect for bachelorette pads or guest bedrooms. Very has a lot of great options for little ones as well. 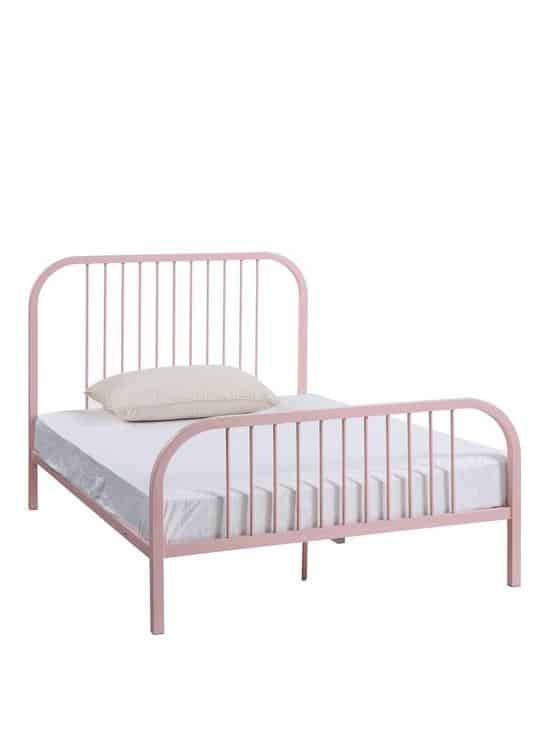 And that includes this metal beauty dripping in blush pink color. 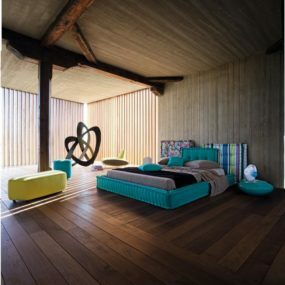 We love how funky you could style this and how easy it would be to blend with a variety of interior design genres. For something on the more extravagant side, check out Neiman Marcus. They have several stunning pieces that you’ll want to think twice about. 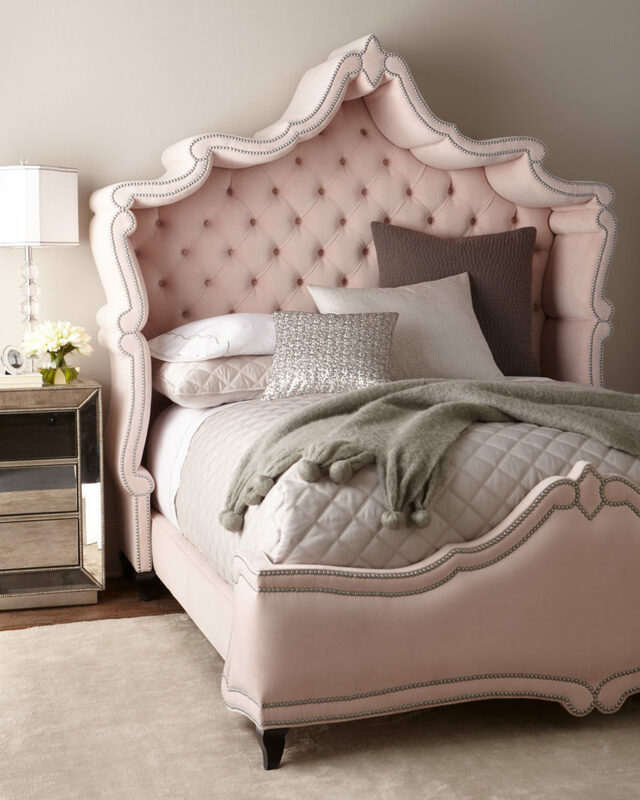 Just look at this Victorian-inspired bed, filled with curving lines and studded hardware. At Home has a lot of great inspiration as well. 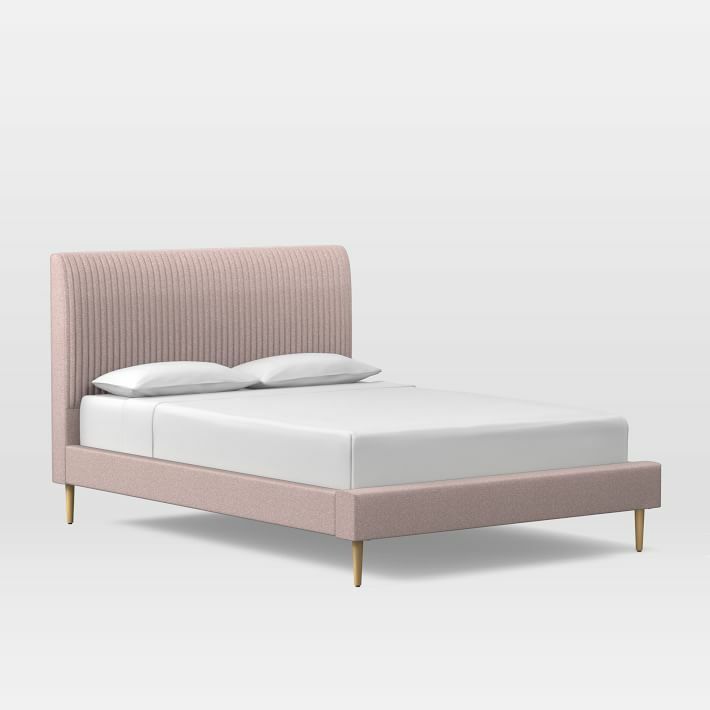 This linen bed has a blush tone and blends nicely with deeper pink tones. 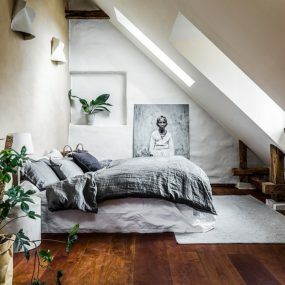 Set up this look inside the guest bedroom or bring a bout of lushness into your own space.